A football fan is celebrating after becoming one of the first female stadium announcers in the English Football League. Laura Beth, who is 22 years old, stood in on Saturday after being asked to take the microphone at her beloved Rochdale AFC. Despite some pre-match nerves, Laura said she "loved it" and hopes it will inspire other women to do the job. To top off the day, Rochdale won, too, beating Scunthorpe United 3-1. 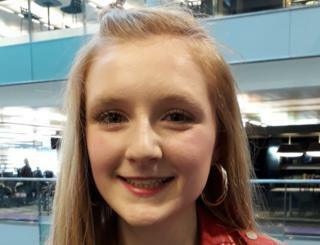 Laura Beth said she was "dreading it" after being asked to stand in for regular announcer Dave Sweetmore at Spotland but enjoyed a busy day on the public address system. "It went really well, lots happening. There was a minute's silence, goals were scored by both teams and lots of match announcements. "The reaction's been really good. I've had lots of comments and my Twitter followers have gone up by 800!" For Laura, League One side Rochdale AFC is very close to her heart. "My mum and dad actually met at the football club - so it is very much rooted in our family." She becomes one of just four women who have performed the role in the English Football League. She also said she's been contacted by a woman who said she is going to try and get the job at Stockport County. "So it has already inspired some people which is really exciting." Emma Saunders, the regular stadium announcer at Premier League club Watford, travelled to Russia in 2018 to work as announcer during the World Cup. The English Football League said: "We absolutely support any efforts made by our clubs to raise the profile of women working within our clubs and the wider game."